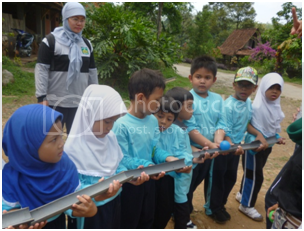 December 10th,2011 was a bright day for all ICP students since it was the day to go field trip to Sekatul. Sekatul is a tourism object that serves the visitor with delicious processed fish, grilled fish and fried fish. The sekatul is located around Kendal. By six cars of Iqro' management, all students and teachers went to Sekatul at around 07.30 a.m. happily. Arriving at 09.00 a.m, some instructors greeted us friendly. The instructors then asked all students to gather in a big cottage. A chief of the instructors gave some guides to students. It was about the rules and instruction that students should obey during the outbound. A moment later the students went to a nice yard to have some warming up exercises so that they would not get injured during the outbound. Singing, making a ring, and laughing or jumping were some kinds of the warming up activities. At the last warming up, the students broke into some groups and then played hula-hoops race. Painting caps was the first activity in Sekatul. Students had to paint the cap that was already furnished with some pictures. Students paint the pictures on the caps with colorful marks. Instructors gave the equipment to students such as paintbrush, and paint color. Pipe Lines was the next activity. The main point of this game was that students made a line within their group. They then should transfer a glass of water hand-in-hand within their group, and the last student fills a pail with the water from the glass. This game teaches students how important work together in group is. A good cooperation with friends was the important key in finishing this game. Planting strawberry was the last outbound activity in Sekatul. The instructors gave the students some seeds of strawberry. All students planted the strawberry in a plastic bag. They were happy because they could bring home this strawberry tree. After completing all the assignment, the students next backed to the cottage to have lunch. They were so tired. 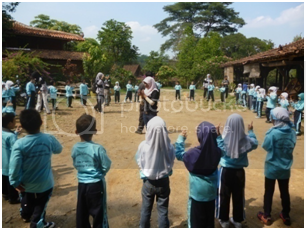 On the closing moment, the chief of the instructor asked the students a relaxing exercise. 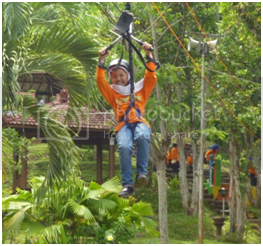 The instructors tried to make us relax and fun after completing the outbound task. The fieldtrip finished at around 12.30 p.m. Some students stayed in Sekatul since their parents had been there to meet their children. Other students went back to school and met their parents on the school. Indeed, the outbound could make students fun. 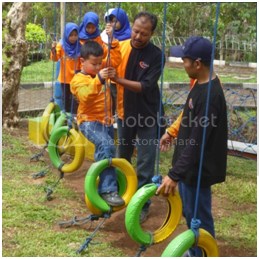 The outbound also teaches the important of working together, be kind to friend and develop creativity. There was one more activity of 2nd grade of ICP. The event was very loved by children. Both boys and girls loved it. The activityy was out bound activity. Out bound this time aimed to train agility and couragement of the students. These activities included learning exercises that were integrated with the game. In addition to the students physically fitness, they also had courages in facing the challenges. 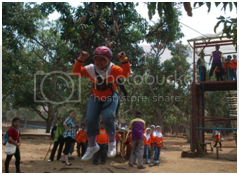 The outbond included flying fox, climbing net, climbing stairs, rope, range, and swing. 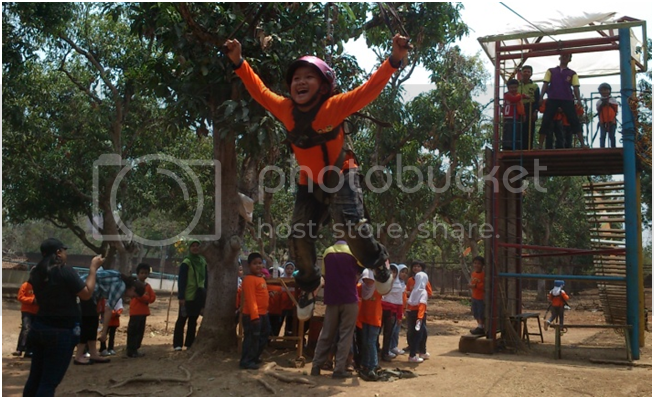 Among the games, the most popular ones was flying fox. Although it was stressful but students liked to do. This one activities were really fun. After conducting a tense out bound, now the students enjoyed the beautiful artificial lake. Gladly they boarded the boat around the lake. They rode a boat in turn with other groups. Slowly, the students boarded the boat, toward the middle of the lake. Breeze adds to the beauty of the atmosphere that morning. 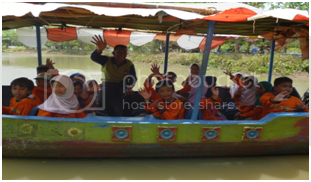 Students cheers also accompanied the speed boat. It felt tired and stress disappeared instantly. From the boat, the students could see the funny monkeys. They loved to tease that monkeys. The monkeys was also intensified his behavior. The monkeys seemed to catch the speed boat. They jumped up and down while swinging through the trees. The children also felt comfort by the doings of the monkeys. Beautiful geese looked back and forth on either side of the boat carrying the students. Similarly, the long-billed pelicans seemed to be looking for food. The atmosphere really made the students happy. 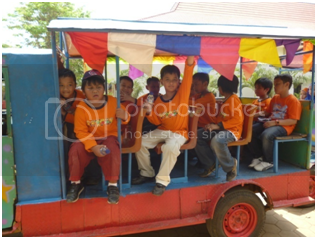 After students were satisfied riding the boat, they invited the teachers to ride the train. Three groups of students were transported by train. They were taken around the lake from the mainland. Although the train was not as good as his parents cars, they were very happy to ride the train. Three cars train was to transport the kids around the lake and park at the zoo. As soon as the train went, the students screamed delightly. They waved their arms and shouting. The atmosphere inside the train became frenetic. One journey did not make the kids satisfied. Even two journies did not make the students satisfied. Finally the train went around three times the lake and park, with the intention of making the kids satisfied buggy. As soon as the train stopped on three laps, the kids were off the train with a sense of satisfaction. Well, those were series of field trip that day. They also got together for lunch. 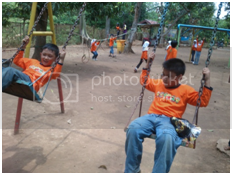 The values instilled by the teachers to the children in the field trip were to master academic subjects, as well as an attitude of courage, resilience, patience, responsibility, discipline, and to cooperate with others. Hooray ..., ride an elephant! How happy the children were at that time. Once completing the task, they asked to finish another task. The children were divided into three groups again. Each group was accompanied by two teachers. 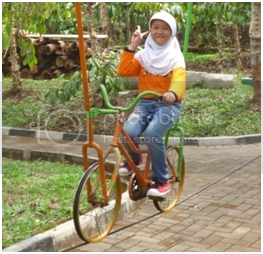 This time the children would carry out activities that were recreational. There are available several places for recreation, like swinging, playing with elephants, and a motorcycle board. 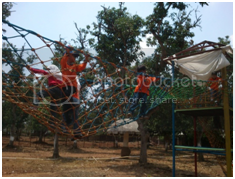 There is also a place for out bound like climbing nets, flying fox, and rock climbing. 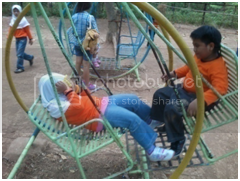 Mr. Nanang soon took over the children. At that time the children were asked to ride the elephant. 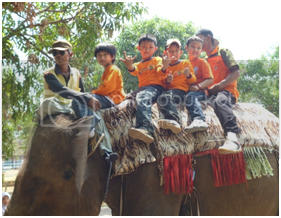 Suddenly they shouted, "Hooray ... we will ride an elephant!" Once their joy, the atmosphere became boisterous. Apparently they could not wait, riding an elephant. 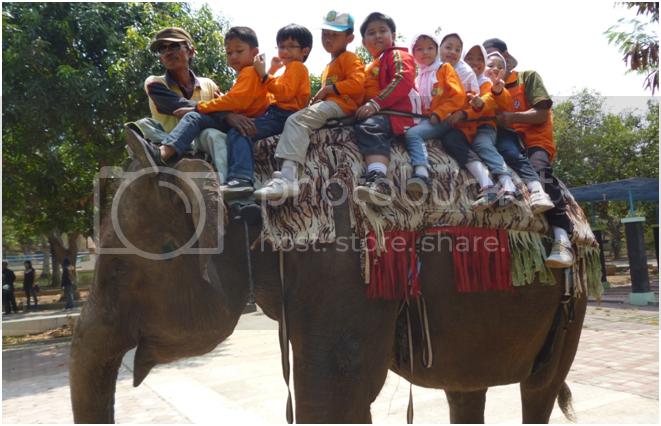 Shortly afterall, Mr. Nanang took the kids to the elephant. There seemed an elephant and two elephants handler, awaiting the arrival of the children. Even children ran towards the elephant. The kids immediately climbed the stairs where the elephant ride. They lined up in an orderly manner. The handler immediately arranged elephant kids going up to the back of an elephant. One by one they climbed into the back of an elephant. Once running, the elephant could carry five to eight children, and his two handlers. "O fun ....!" shouted the children. Slowly elephant started walking. Children were even more excited, as elephant walking around the park. Laughter sounded boisterous. Not at all the kids were scared. It appeared from the face, they were thrilled. In these activities, the goal was to train children courage, unity, cooperation, and friendship with animals. 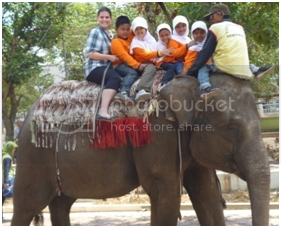 In addition, the children also understanded that a tame elephant beneficial to humans, of which is to transport. Out Bound, who is afraid? At the end of the lesson the students were invited to a coffee plantation in Banaran. There, the students, did out bound. They practiced dexterity, courage games, and at the same ingratitude towards God. Apparently the event was very interesting for boys and girls. They were very enthusiastic about doing activities out bound, there. first, the students took light activity. They jumped up and down on the concrete. Then walking climbing nets, crawling, and walking on a wheel hanging rope. After that the students were engaged in activities that were challenging. 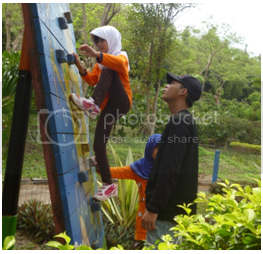 They climbed the cliff board, climbing bridge, cycling on a rope, playing flying fox. 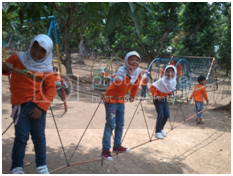 After those challenging activities, students were engaged in activities that were recreational. They were invited to a special ride, and surrounding coffee plantations. Apparently the scenery around the garden coffee was excellent. There they could see a lower level. They could also see Pening swamp, known from Barukelinthing story. 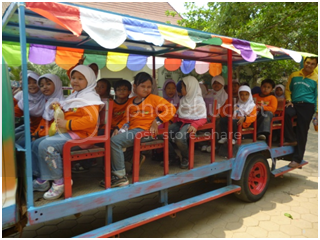 Recently, the class I C-D of ICP, held a field trip, to Kampung Jawa Sekatul. 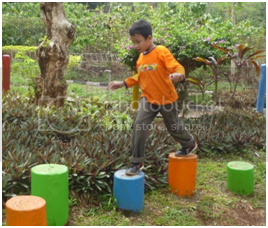 The activity was held in the framework of contextual learning outside of school. This time the students learned science, crafts, and sports thematically. What is a thematic learning? Thematic learning is learning that combines several subjects in a learning process. So one learning process can cover multiple subjects. Learning is carried out with the direct practice and packaged in the form of a fun game. The purpose of learning was that children could explain a part of the plant, could color the images that had been drawn before, and could perform gymnastic movements well. Meanwhile, the characters which were expected with the learning process was the spirit of cooperation, love of nature, independenvy, thorough and responsibility. 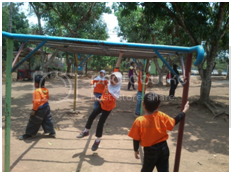 As the first activity, students had warmed up activities. This activity was packed into the game, gymnastics and singing, guided by coaches and teachers. On warming up activities, the students performed sports activities. It was expected the students to be healthy and fit, both physically and spiritually healthy. The next activities were water playground, ball, and pipes. In this activity the students worked together to move water from one place to another place through the mutual cooperation pipes. After moving water, the students moved the ball, by rolling through the pipe. 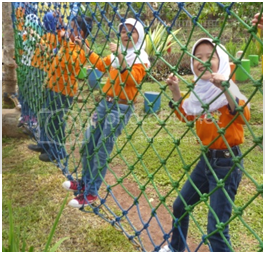 The students were very careful in doing such activities. If they were not careful, the water would spill on the pipe joints. Likewise with the ball, if sloppy, the ball would fall from the pipe. In this game the teachers wanted to instill an attitude of responsibility, accuracy, careful, and cooperation to the students. After playing with the water pipes, next the students played with plastic cups of water. Now the students moved water from one bucket to another bucket to work together in the relay. They moved water using a hollow plastic cups. This activity was more difficult than the first event. However, this activity was a challenging and better cooperation. So that it could move water quickly and there was not much water that was spill out. On these activities, the teachers actually taught the students to have a spirit of hard work, tenacious, and tough. it is also the spirit of mutual help and cooperate with each other. Moving holahop was the last game. This game moved holahop from the student body to the body of the other students. This activity was very exciting. Many students had difficulty in moving the object. Especially if the students are so fat, they got trouble in entering the circle holahop. However, with effort, finally they were able to fulfill their activity. The students were very happy and excited.